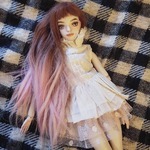 Question: I recently purchased my first porcelain bjd (Triffony Spinx) and was wondering if I need to wear gloves when handling her? I know I have to wear gloves with resin. I didn't think I had to with porcelain but I saw some videos of a different artist posing porcelain dolls and she was wearing gloves. Thanks! No, absolutely not, you don't have to wear gloves to handle a porcelain doll. I find using gloves to handle a porcelain doll in a video to be gimmicky. In one of Marina B. 's older blog posts she writes about scraping the glue off one of her doll's heads using a metal instrument, without harm. IMO you don't need to use gloves for resin either. It's a good idea to wash your hands first so there isn't excess oil on your hands, but as long as you don't touch the face (or other blushed/manicured/tattooed areas), you skin will not harm the resin itself. The oil on your skin can have a slight effect on the sealant over time, so if you wash your hands it's enough for me at least. It can't damage the resin as far as I know. Personally I find the very high end resin do pose better. Specifically Popovy, Enchanted Doll and the spring-strung Marmite sue dolls. * Generally I find posing easier but I think it depends on the company/artist. 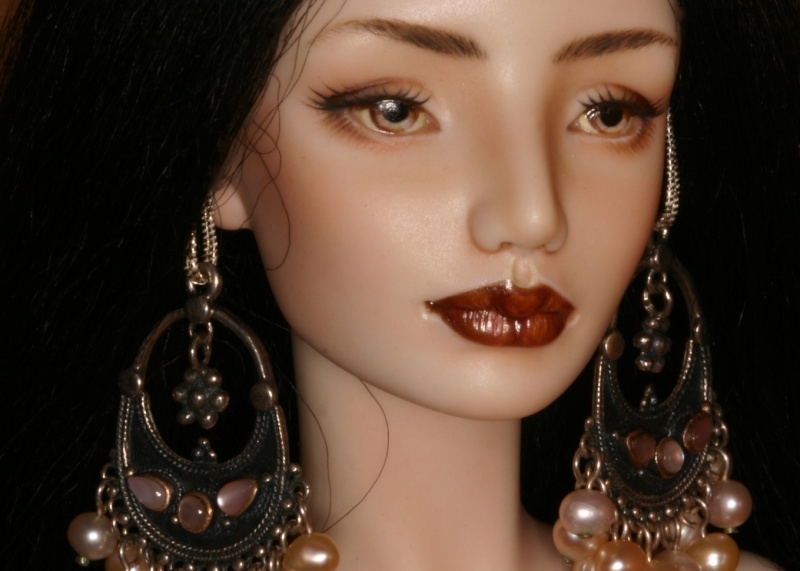 * You can change the face anytime you like- so if the doll is a beautiful sculpt but you have a face-up artist in mind- or if you happen to be able to do your own face-ups. Not my thing but I know a lot of people like to do this I guess. Biggest con for porcelain is fragility. Biggest con for resin is that it yellows, and the paint/body blushing is SO easy to chip/rub off. I've just found this thread. I also asked the same question when I first started collecting bjd's. My collection is mainly resin, all but one, which is a Lidia Snul Bjtales Porcelain. She is beautiful and incomparable in quality, detail and realism. She also poses really well too. Having said that, I have owned other Porcelain girls by other artists that were not of the same quality and some of my resins were, in my opinion, better and I ended up selling the porcelains. My Bjtales Porcelain is, in my eyes, perfection but then I am biased as I think Lidia Snul is the most talented bjd artist out there. Her resins are not on the same level as her porcelains but are better than some other artists porcelains. Again, matter of opinion. I think what I am trying to say is that it's not so much an issue for me as to whether Resin beats Porcelain or vice versa. It's about how good the artist is with a particular medium and whether I like the doll or not. For example, Popovy dolls are Resin but far superior than some of the porcelain dolls out there. If I fall in love with a doll, it's immaterial to me whether it's Resin or Porcelain. This is such a great thread for a newbie to porcelain like myself, and just reinforces my decision to start collecting the porcelain alongside the resin. I love the complete artistic element and characterisation that is open to me with the resin medium (love doing the face-up's myself and the making of the wigs) but I would not buy another artist full set in resin. These I will now save for in porcelain. I feel that I will have a perfectly balanced hobby in this respect and be investing my hard earned money into something of quality and a medium that will not breakdown and discolour overtime. 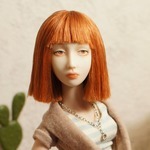 I am thrilled to read your comment above Bellabronte, about Lidia Snuls dolls of BJ Tales in the porcelain medium. I LOVE her dolls but was so disappointed with My Jpopdolls resin Phantom. She felt plasticky and cheap, and did not pose well imo. To hear that her dolls in the porcelain are so lovely is music to my ears! Yellowrose I am sorry to hear that your Bjtales Phantom was disappointing to you. I have owned Phantom myself and admit that, as much as I love Lidias dolls, this one I felt was not one of her best. However, do not be put off by that as others of Lidias creation in Resin are beautiful and pose beautifully. I will add that her dolls are not good for standing poses and do better in sitting/lying positions. As I said before, I allow for both resin and Porcelain in my collection and go with what I like the look of. Thank you bellabronte. This is really good news and music to my ears, as I love some of Lidia's other sculpt's too, but didn't feel that they would have been any better. Now I can re-think! Interesting thread I don't have a porcelain doll yet and I was also wondering what the less-obvious differences might be... I'd be mostly worried about knocking her over, but I suppose you don't really "play" with an artist doll?